Q: My spouse and I agreed to a prenuptial agreement that specified I would not have to pay child support in the event of divorce. Will this agreement about child support hold up in court? A: In California, child support terms in prenuptial agreements are not enforceable. The court will assume that any child in a marriage has a right to support, and the court will look to the California child support guidelines. In short, California will not uphold a contract term that involves one parent contracting away a duty to pay child support. By the same token, the court won’t allow parents to contract about child custody in a prenuptial agreement. For instance, if two spouses believe they entered into a valid prenuptial agreement that included instructions for child custody in the event of divorce, they should know that a California court won’t agree to such a provision. When deciding child custody issues, the court will always take into account the best interests of the child. Q: My spouse signed a prenuptial agreement in which she waived spousal support. Will the court still require me to pay spousal support? A: It depends. 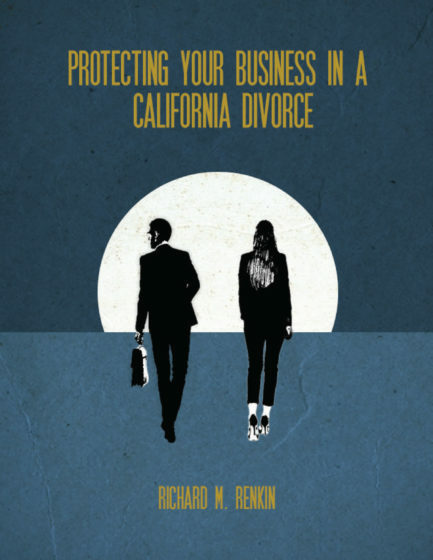 In California, the Uniform Premarital Agreement Act governs prenuptial agreements. The law does allow a spouse to waive her right to spousal support in a number of cases, but in general the court must find that the provision isn’t unconscionable. How does the court define an unconscionable agreement? It will look at various factors, such as the disparity of wealth between the parties, the separate property of the spouses, and the earning potential of the spouses. In situations where one spouse has waived her right to support but would be left nearly destitute without spousal support, a court may refuse to enforce the provision. In addition, some courts may not enforce prenuptial agreement terms that waive spousal support in cases where the receiving spouse didn’t understand that she was signing away her ability to seek support. For example, if the receiving spouse signed the prenuptial agreement without consulting with an attorney and didn’t understand that she’d be left without spousal support in the event of divorce, a court may not enforce that provision. Q: My spouse and I entered into an oral prenuptial agreement. In this prenuptial agreement, we made several significant agreements concerning the division of property and spousal support. Will the court uphold this? A: No. 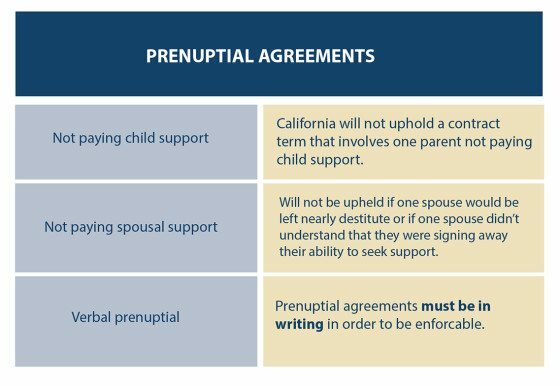 Under the California Family Law Code, prenuptial agreements must be in writing in order to be enforceable. If you have an oral prenuptial agreement, the provisions you’ve agreed to will not be upheld in a California court. Prenuptial agreements can be very complicated, and it’s important to talk with a San Diego divorce lawyer about your situation.